Mexico called us from the grip of the Midwestern winter. While the windows iced up Saturday morning, I almost felt warm sand beneath my feet as I layered on two T-shirts plus a cardigan under a windbreaker and said good-bye to my down parka for a week. Ladies in long swinging skirts offered margaritas in plastic cups as we streamed from the airport immigration hall, and sunglasses popped on as we hit the taxi line. Six flights up and right over Los Muertos beach, old Puerto Vallarta spread before us. Ceiling fans whirled across rooms opening westward onto the oceanfront packed with umbrellas for sunbathers, and the palm-clad hills rose into tropical forests to the east. I unpacked my stack of books, sloughed off shoes and flopped into a deck chair where I planned to spend the next several days. As hours passed, hunger set in and scents of tantalizing Mexican roasting pork and slow simmering beans seemed to waft up from the alleys. We set out following our noses and a little information. Although we found a few fabulous Margaritas and Negra Modelos in iced bottles, most of the restaurant food left me shaking my head. Too many gringos in this town had lowered the standards and dictated the flavors for delicate palates. I was soon ready to run to an open market and pull out the pots in our flat. On one restaurant occasion, we taxied up a winding hill above the river, climbed the steps to the two-starred Red Cabbage, a charming spot packed with reminiscences of Freda Kahlo. My hopes were high until I looked at the menu, which I doubt had changed in ten years. Having felt meated out in the two previous days, I opted for their “famous” black bean soup with traditional garnishes. When the soup arrived, I wondered if it was a joke. My bowl of the famous was nothing more than a ladle of watery black beans. I added a little salt, broke in a tortilla, sprinkled over the bit of chopped onion and green chili on the side. It was lean and light and would sustain me until the next day, but that’s all it was, alas. 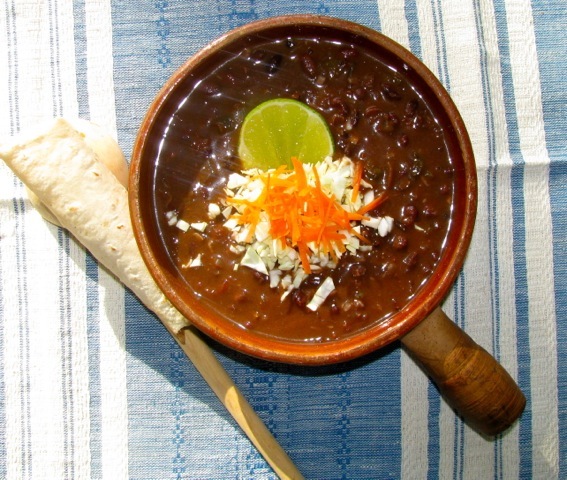 Here’s a black bean soup that sings of Mexico, the likes of which I wish I’d have had that night. Soak the beans in 6 cups water overnight. Drain and cover with 6 cups fresh cold water. Plan to cook beans for 1-3 hours at a slow simmer, use a crock pot or hurry it up in a pressure cooker. (I love the pressure cooker for beans!) Add the 2 garlic cloves, a dry chili, either a chipotle or a chili d’arbol, and the small chunk of fatty bacon or oil. Cook beans until melting tender, only 15 minutes under pressure. Meanwhile sauté the chopped bacon in a deep soup pot until the fat has rendered. Into this bacon and fat (or oil) add the diced onion, celery, carrot and pepper. Cover with butter wrappers or waxed paper and sweat until tender. Add chopped garlic, cumin, crushed red pepper (and the chopped, seeded chipotle pepper cooked with the beans if desired). Stir in the tomato paste and sauté until spicily fragrant. Add the diced tomatoes. Remove the whole garlic cloves and the bacon chunk from the cooked beans and add all the beans and bean liquid to the seasoning base in the soup pot (you should have 8-10 cups of beans plus bean broth). Bring to a simmer. Add cider vinegar and a good amount of salt to taste. Cover and cook slowly for an hour or two. Serve with yogurt or sour cream or shredded cabbage, cilantro and fresh lime, with soft corn tortillas on the side. Makes 3½ quarts of soup, which keeps for a week in glass jars or may be frozen in plastic cartons. Here we are at the year’s end with a bottle of Champagne in the fridge, lots of holiday leftovers and nothing special for dinner. Determined not to grocery shop today, I set out 2 ounces smoked salmon, half an artisan sausage, 3 slices of grilled steak, 4 meaty mushrooms, a scoop of Greek beans, 2 slices peppered bacon, an avocado, broccoli, Boston lettuce, a tiny cucumber, a ripe Comice pear, a sliver of Brie and a lump of Roquefort. 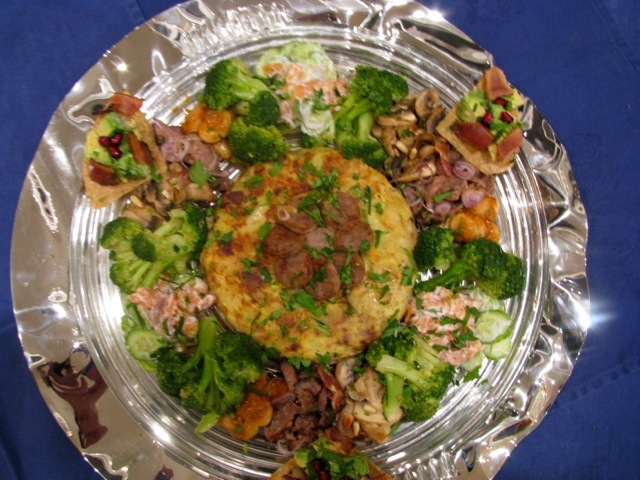 My challenge this afternoon is to create an elegant tray of tapas from leftovers. We’ll nibble the bits and savor the bubbly. For a little midwinter sustenance, I’ll make a small potato tortilla to center our array and top it with sliced sausage. The rest of my plan: julienne the salmon and combine with sliced cucumber, yogurt and a bit of red onion; mix the Greek beans with celery leaves; dice the steak and dress with mashed roasted garlic, olive oil and drops of balsamic vinegar; sauté the sliced mushrooms with rosemary and pine nuts; crisp the bacon and break over avocado with pomegranate seeds on corn chips; blanch the broccoli and dress with soy sauce and sesame oil; make a green salad with tarragon vinaigrette; save the pear and cheese for dessert with fresh toast. Heat oil in large, heavy frying pan. Add potatoes, onion, garlic, chili, salt and cook, partially covered, turning from time to time. Try not to allow browning, and cook gently until potatoes are fully tender. Dump cooked potatoes into sieve or colander set over plate. Wipe out frying pan with paper towel and return to stove with heat on. Beat eggs in wide bowl; add salt. Pour film of oil drained from potatoes back into frying pan. Add potatoes and optional sliced peppers to beaten eggs, and quickly pour mixture into hot pan. Reduce heat and cook shaking from time to time until almost set. Flip pancake out onto oiled plate, film pan with bit more oil and slide cake back in pan to cook other side. When set and browned, turn out with best side up. Cool to room temperature. Cut into squares or wedges. Do not refrigerate before serving. Tortilla will stay fresh several hours, but chilling changes flavor. You are currently browsing the Mary Jo's Kitchen blog archives for January, 2013.